Shenandoah's Eclectic Scribblings: 12 Days of Pioneer Christmas, Day 6: my own novella, Defending Truth! 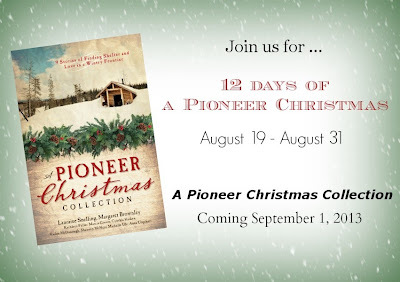 12 Days of Pioneer Christmas, Day 6: my own novella, Defending Truth! And look what I held in my hands for the first time this week! This is my debut as a published author--Anna's as well. I've already shared the story of how I got my first contract, at last year's ACFW conference, and during the past week I've been amazed at the fulfillment of hope from a year ago. Other hopes fill my heart now, as I face attending ACFW again in just three weeks. What does God have for me this time? I discovered a rather crucial typo just two days before receiving my first copies of the book. The Battle of Kings Mountain actually takes place in October 1780, not 1781 as the book says. Argh! How did this happen? It's right there, in the galley, in my own drafts, in the original proposal, for crying out loud ... and I never noticed. All I can figure is that I was so deep in finishing my full-length historical, which finishes up in September 1781, that I typed that year without thinking. Three female characters in the collection, across three different novellas, share the name Milly. :-) One is Truth's aunt, named after the real-life Milly (Millicent) Bledsoe, married to the real-life Loving Bledsoe. Truth's four younger siblings are loosely modeled after my own four younger children. Three of those read Defending Truth before I turned it in to my editor. Any other questions? If I haven't answered them here or in the Pioneer Christmas interview, feel free to ask! And don't forget to enter the giveaway for a copy, signed by all nine of us. Anna is giving away a copy as well, so you can enter over on her site for even more chances to win! 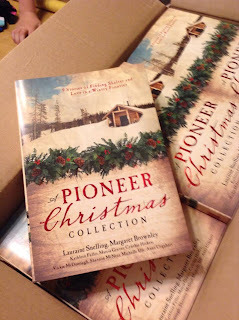 A Pioneer Christmas Collection Release!! Hi Shannon, Big congrats from Rose who got my first contract from Barbour at the ACFW conference in Indy in 2010. Enjoy the ride! Congratulations! I look forward to reading Defending Truth1, and more in the Pioneer Christmas Collection! And thank you, Kimberli! I couldn't have done this without you. Hugs!! I am looking forward to reading the stories in the Pioneer Christmas Collection. I am so looking forward to reading the novella collection! I love ones that are Christmas themed!